Wow! These breakfast tacos were fantastic! 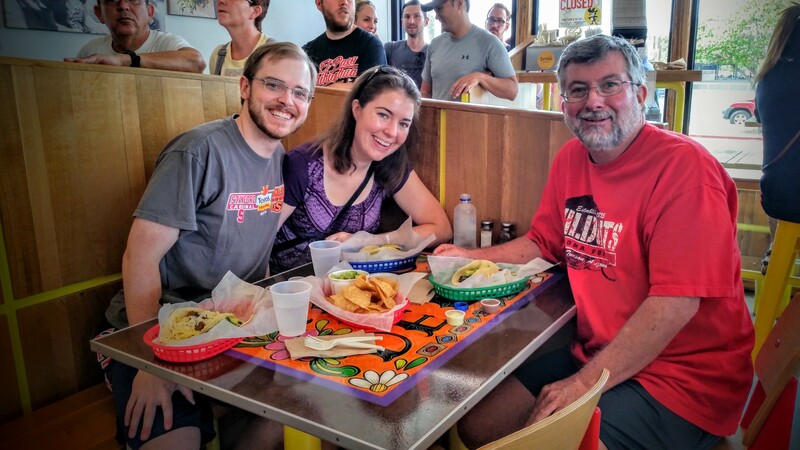 After a wonderful bike ride where I saw 2 deer, I met John and Michelle at Tacodeli for breakfast tacos. Apparently, this is a very popular thing to do in Austin, Texas. The line was out the door when we arrived, but seemed to move fairly quickly. I do not think I have ever had breakfast tacos. These are not your standard tacos with beef and cheese, but an entire menu of different combinations of ingredients. Two tacos was a full meal and they were absolutely wonderful! Lots of yummy flavors to savor and enjoy. Austin has been hot and humid (105 yesterday), but today there was rain at the motorhome in the morning, some cloud cover, and a nice breeze. The temperature is heating up, but it is much more comfortable compared to the previous few days. I have really enjoyed the opportunity to visit with John and Michelle!